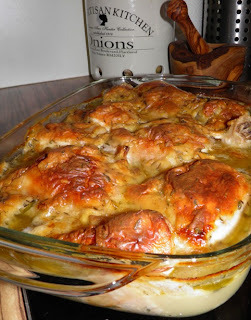 The original recipe mentioned that the cooking process could be speeded up by baking the dish for 1.5 to 2 hours in an oven of 160 degree C. But I thought cooking the dish slowly may make the chicken more tender so I opted for the time consuming version. I am telling you, the wait is worth it! Too bad I couldn't find fresh oregano, or the dish would be even more herby! 1. Heat the oven to 120 degree C. Place chicken pieces in a buttered casserole dish. 2. Heat a medium saucepan over medium heat, melt butter and cook mushrooms and onions for about 5 minutes. Stir in flour, add in warm milk, and continue stirring until the flour and milk make a smooth sauce. Remove from heat. Stir in lemon zest, lemon juice, herbs. Season with salt and pepper. Pour sauce over chicken. 3. Bake uncovered for 2.5 to 3 hours. Serve chicken over a bed of rice with cream sauce on top.